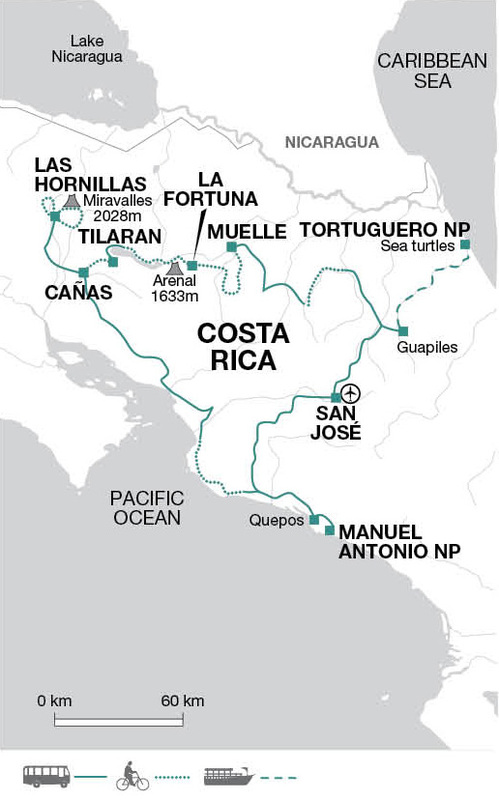 On this cycling tour of Costa Rica we discover a diverse land rich with nature, towering volcanoes and abundant wildlife. We start in the lush rainforest of Tortuguero on the Caribbean coast before cycling through the ever-changing landscapes of the interior past active volcanoes, lakes and cloudforest in the Arenal and Miravalles areas. Finally we reach the Pacific Coast and beautiful beaches of Manuel Antonio National Park. Our journey begins in San José, Costa Rica's capital. Founded in 1738 and set in a fertile valley blanketed in a lush abundance of coffee and sugar cane plantations, the city is one of the youngest and most cosmopolitan capital's in Central America. Early this morning we leave the capital and head towards the Caribbean coast. Our destination is La Pavona Pier, around a three and a half hour drive away. The journey takes us through Braulio Carillo National Park and on arrival we'll board a boat and continue along the Tortuguero River, towards the richly diverse landscapes of the Tortuguero National Park. The first part of the cruise takes around an hour, before we stop off at the Visitor Centre for a brief orientation, after which we'll continue by boat to our lodge. After lunch, this afternoon is then free to explore your surroundings in a little more detail, with the option to rent a kayak, or just relax on the beach. Tortuguero's remarkably rich landscapes include rainforests, mangroves, swamps, beaches and lagoons and we'll spend this morning discovering something of its stunning natural diversity. After an early morning coffee, we'll head out on a guided boat tour along some of the park's canals and waterways, which provide home for manatees, crocodiles, Tropical Gar and an abundance of freshwater fish. Returning to the lodge for breakfast, we then set out on a jungle hike through the surrounding rainforest. These forest are home to sloths, three of Costa Rica's four species of monkeys and a huge variety of birdlife. After lunch, the afternoon is then free for optional activities. Leaving Tortuguero this morning we head back to La Pavona Pier by boat, a journey of around two hours. From here we then drive on to Guapiles, lying in the heart of the country's banana growing region, where we'll stop for lunch before driving on to the starting point of our cycling adventure close to Sarapiqui. After checking the bikes over and ensuring that they are properly adjusted we'll begin with a relatively easy introduction, riding along tarmac roads that take us through a rural setting of farmland and banana plantations. Our ride will be mainly on the flat today and afterwards we drive for about 1.5 hours to our hotel in the small crossroads village of Muelle de San Carlos. Our total cycling distance today is approximately 20 kilometres (total accumulated ascent 50 metres, total accumulated descent 180 metres). Beginning from the hotel today we cycle through a landscape of undulating terrain, passing through a rural scene of farms, cultivated fields and patches of tropical forest. Arriving in Muelle we'll stop and look for some of the huge iguanas that can occasionally be found here, before continuing on to La Fortuna. Weather permitting we may be accompanied by the spectacular backdrop of the Arenal Volcano and arriving at our next hotel by bike, this afternoon is free to explore a little of La Fortuna at your leisure. You may with to visit the local La Fortuna Waterfalls. Our total cycling distance today is approximately 28 kilometres (total accumulated ascent 330 metres, total accumulated descent 150 metres). With no cycling scheduled, today has been left free to enjoy a number of other activities including canopy tours, zip lines and hot springs. The city's downtown area is dominated by the classic cone of Arenal Volcano, one of the world's most active volcanoes, and the itself town is blessed with a number of thermal springs where you can relax and unwind in the natural hot water pools. A short drive this morning brings us to the site of the impressive Lake Arenal, the largest man-made lake in Costa Rica. Beginning our day's riding at the base of the volcano, we'll follow the northern shore of the lake and negotiate our way through a landscape of rolling hills, rainforest and pastureland. Arenal Volcano lies at the heart of a stunning national park that covers some 9,884 acres and is home to 850 species of birds including the endangered resplendent quetzal. We'll enjoy some fine views of the lake and the volcano during our ride this morning, before finishing the rest of the journey by car after lunch. Our final destination is the small town of Tilarán, located in the hills overlooking the western shores of the lake. Total cycling distance today is approximately 27 kilometres (total accumulated ascent 830 metres, total accumulated descent 800 metres) with an extra optional 17 kilometre ride starting earlier in La Fortuna. We start our day with an optional excursion to visit the nearby Viento Fresco Waterfalls by bus where you will have the opportunity to swim and explore up to five waterfalls set in the rainforest. In wet conditions access to the falls is not recommended and we would start today's ride after breakfast instead arriving earlier into Cañas. After returning to the hotel we get on our bikes at around 11am for an easy ride down towards the drier plains of Guanacaste today, enjoying some spectacular views of the Pacific coastline and the chain of volcanoes that lie to the north. Our ride ends in the small community of Cañas, from where we will drive the short distance to our hotel situated some 5km from Cañas near the Corobici river. You have the option to continue cycling 15 km to Bebedero and the Tour Leader will be able to help arrange an optional boat excursion on the Corobici River for bird watching and to spot wildlife such as crocodiles and monkeys. Total cycling distance today is approximately 22 kilometres (total accumulated ascent 300 metres, total accumulated descent 780 metres) with an extra optional 15 kilometres (+60m/-130m). An early start to make the most of the cooler temperatures, today provides us with our most challenging ride. Beginning with a short drive to Bagaces we'll start with a gentle uphill ride, heading north towards the Miravalles Volcano. The route is mainly uphill but the gradient is gradual, so the answer is low gears and a steady pace today. We'll make a number of longer stops too, making the most of the breathtaking scenery as we make our way to Yoko Termales, on the slopes of Miravalles Volcano. Finishing the day at the higher and cooler elevations of the slopes, we'll be rewarded this afternoon with a welcome dip in the natural hot springs. Our total cycling distance today is approximately 27 kilometres (total accumulated ascent 700 metres, total accumulated descent 200 metres). The Miravalles Volcano is the highest peak in the Guanacaste Mountains (2,023 m) and sits in the heart of the largest geothermal field developed in Costa Rica. Another day here affords an opportunity to relax and enjoy more of its unique attractions, with a three to five hour ride along the slopes of volcanoes and through the forest to Liberia (returning by vehicle), providing the perfect excuse for revisiting the hot springs. The volcano's verdant slopes form part of the area's protected zone, which is a lush haven of cloud and primary forest that provides shelter for coyotes, howler monkeys, peccaries and even pumas. For anyone not wanting to cycle there are other options available including hot mud baths or a walk to Las Hornillas, to visit its active volcanic crater. Our total cycling distance today is approximately 37 kilometres (total accumulated ascent 490 metres, total accumulated descent 920 metres). Day 11 - Early morning loop cycle from hotel. Drive to Manuel Antonio N.P. Early this morning we will explore the local area further on a circular bike ride. After the ride you will have time to shower and change before we check out of our hotel in the late morning. We spend the rest of the day making our way by bus (4 hours) to the Pacific Ocean and onto our final destination at Manuel Antonio National Park. We will break the journey for lunch and at Tarcoles Bridge where we will hopefully spot a few of the gigantic crocodiles that regularly bask beside the river's edge, before finally arriving at our hotel later this afternoon. Our total cycling distance today is approximately 29 kilometres (total accumulated ascent 400 metres, total accumulated descent 400 metres). One of Costa Rica's most popular parks, Manuel Antonio provides a wonderful mix of world class views and golden beaches along the country's central Pacific coastline. Today has been left free to make the most of this idyllic spot, with plenty of options available for sea kayaking, canopy walks, fishing or just relaxing on the beach. The national park is home to a rich diversity of flora and fauna and a walk through its primary forest provides a chance to look for sloths, monkeys, iguanas and over 180 species of birds including toucans, parakeets and potoos. After a relaxing morning we'll drive back to San José after lunch, an approximate five hour drive that should get us back into the capital in time to enjoy a stroll through the centre of the city before dinner. Tour ends in San José after breakfast. Seasonal weather patterns can be unpredictable. Up-to-date information on the weather worldwide can be found by following the BBC weather link on this page. Costa Rica has a tropical climate with high temperature humidity and rainfall. The average temperature is 21°C in the highlands and variable in the lowlands. The rainy season is from May to November and the summer from December to April, but it does still tend to rain, usually in short bursts. Bear in mind that Costa Rica has 12 microclimates and weather can vary significantly in one day. General: Pack essentially for hot weather. Bear in mind that the region is tropical (humid) and that days can be very hot. Lightweight rainwear or an umbrella is advisable all year. Casual clothes are the most practical (something with long sleeves, and long trousers for evenings), and tight fitting garments should be avoided. A swimming costume is recommended. On all Explore cycle holidays we strongly recommend you bring along and wear your cycle helmet. It is a legal requirement in Costa Rica to wear a helmet that meets current safety criteria. In case of an accident resulting in personal injury, certain insurance policies are invalidated in cases where a helmet was not being worn. Although entirely voluntary, tipping is a recognised part of life in this region of the world. Some local staff will look to members of the group for personal recognition of particular services provided. In order to make things easier for you, the Tour Leaders may organise a group's tips kitty and if this is the case, they will account for it throughout the tour. Accordingly, you should allow USD 35 for group tipping. Ten percent tip is expected in restaurants. Local currency in Costa Rica is the Colon. You can choose to either change your money in advance or on arrival at the airport. Here you will find both ATMs and Bureau de Change. The exchange rate with the Colon is approximately 790 CRC to the British Pound. Please check on line for up to date information We recommend you take some emergency cash in USD as the GBP exchange isn’t very good. Notes should be in good condition otherwise they may not be accepted. Costa Rica: Citizens from the UK, US, Canada and most EU countries do not require a visa for a stay up to 90 days. Citizen of Australia, New Zealand and the Republic of Ireland do not require a visa for stays up to 30 days. Other nationalities should consult the relevant consulate. You should confirm all visa related issues with the relevant Embassy prior to departure. 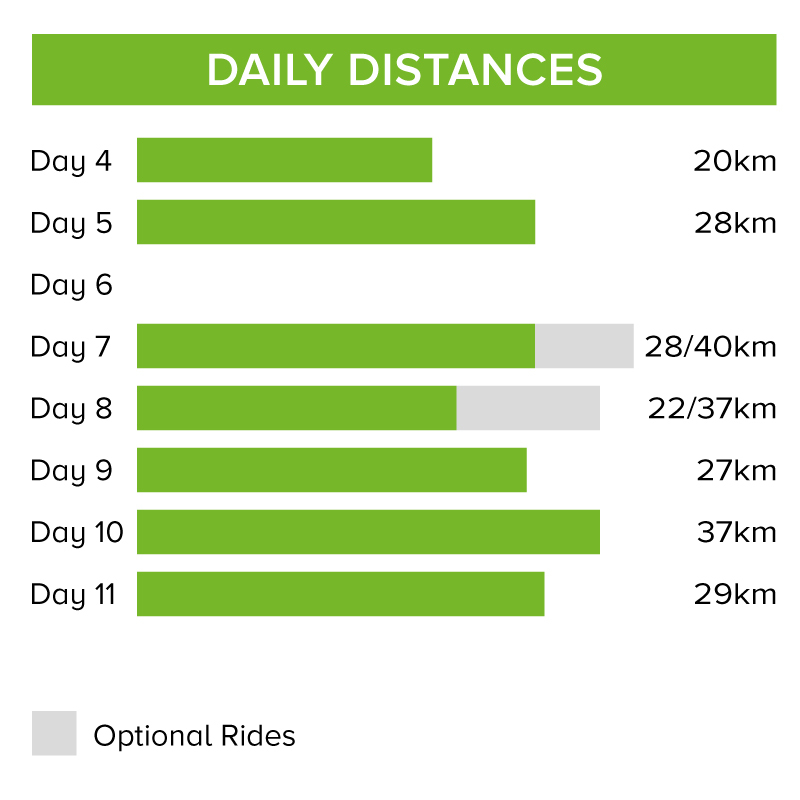 On this tour we cycle 191 km over seven days (an average of 27 km per day) with further optional rides available. The terrain is mostly undulating with some flat sections mixed in. Most of the route is on tarmac roads with about 15% on dirt or gravel roads in reasonable condition. The tour starts gently and builds up with moderate graded rides on days 7, 9 and 10 with several uphills. A support vehicle accompanies the rides throughout. We have graded the route as easy to moderate. Your included bike will be a 27 gear Trek 4500 mountain bike and will be the correct frame size for your height. A water bottle holder is included as well as the facility to fit your own pedals or saddle if you wish to bring them. A support vehicle accompanies the rides throughout the tour. We provide spare parts and take care of the day to day maintenance. All you need to bring is your own helmet.